Roddy MacDonald scored a hat-trick as Kyles came from behind to down Fort William 5-3 on the opening day of the Marine Harvest Premiership season. Kingussie opened their campaign with a 1-1 draw at home to Lochaber. And in an upset of the previous season's form book, Oban Camanachd travelled to Drumnadrochit to record a 3-1 victory over Glenurquhart. Defending champions Newtonmore, Lovat and Skye were sidelined by postponements. MacDonald got Kyles off to a flying start at Fort William with two goals in the opening quarter of the game. The match was suddenly turned on its head just before half-time, though, when a Daniel Stewart strike was followed by Bryan Simpson squeezing in a double just ahead of the whistle. Ross MacRae drew Kyles level soon after the restart and they went ahead again when MacDonald completed his treble. Dunky Kerr added a late fifth to secure an opening win for the 2015 Premiership runners-up. At the Dell, Pat Toal drew first blood for Lochaber just before half-time and so it stayed for half-an-hour. Then Ryan Borthwick grabbed a point for Kingussie, whose last game was a 2-0 relegation play-off victory over Kilmallie. It was only in the latter stages of last season that Oban Camanachd escaped that play-off themselves but they were in fine form for their visit to MacTavish Cup holders Glenurquhart. 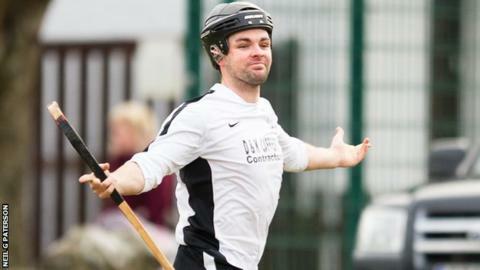 Willie Neilson bagged a penalty and Daniel Cameron also scored to put Camanachd 2-0 up within 24 minutes. Neale Reid provided a vital lifeline for Glenurquhart just before half-time but the home side could not build on it. Malcolm Clark got Camanachd's third. The most significant result in the National Division, at the Winterton, was only a goalless draw but it involved sides which were previously two leagues apart. Inveraray arrived in that division after finishing bottom in the Premiership while visitors Bute got there as they recovered from a traumatic period by winning the South Division title. Elsewhere in the second tier, Beauly won 5-2 at Inverness and Glasgow Mid Argyll eclipsed Ballachulish 4-0 at Yoker.